What are good sketches made off? To me, it seems like good sketches are not just about technical skills or about how lifelike a drawing is. Maybe they are about emotions and how well you can communicate feelings through your work. Good sketches capture the feel of a place and a moment in time in a way that’s unique to you. The full concertina sketchbook for my last entry for the sketching competition on drawing people at work. For the last sketch of my ‘Drawing People at Work’ series*, I wanted to capture the atmosphere of a place and show what it might feel like to work there. I went to draw my friend’s sister – Amy, who works in a cafe. 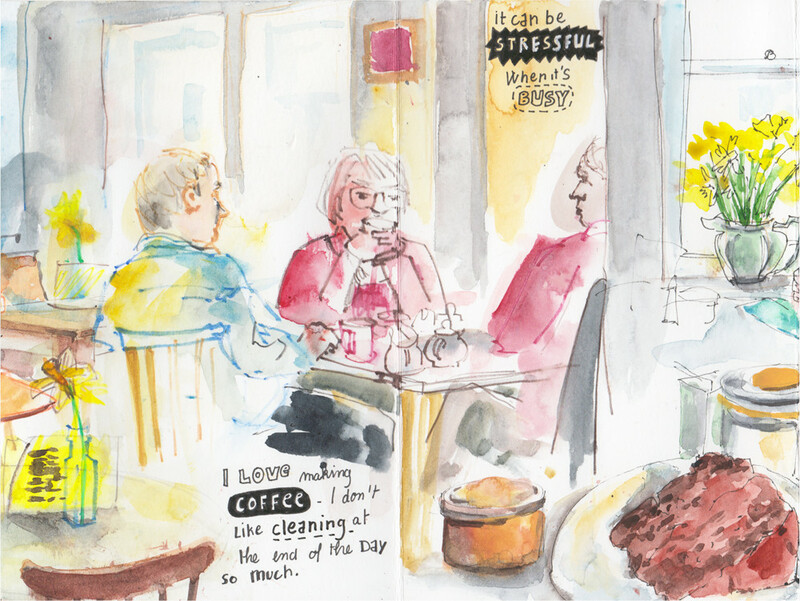 I wanted to sketch the Spring light flowing through the windows, the customers in the shop and Amy at work. And more ambitiously I wanted to try and an impression of the taste of cake and the smell of coffee. 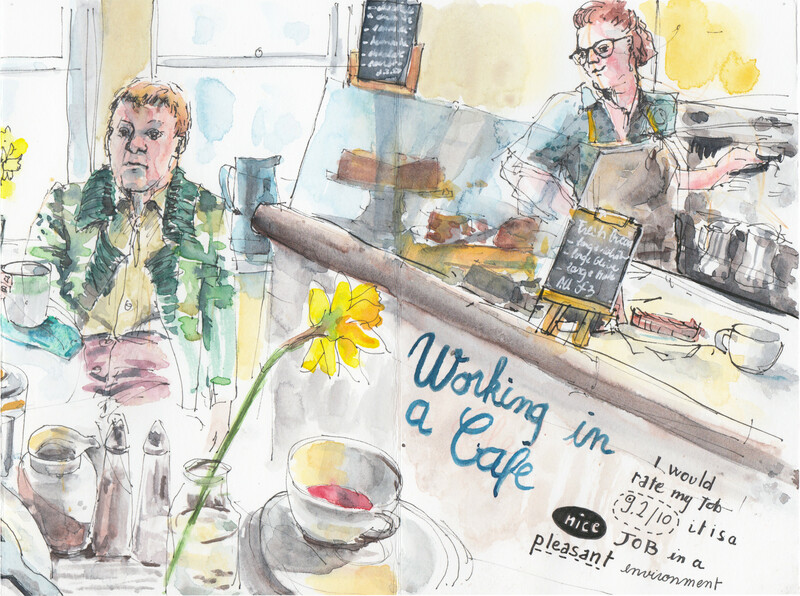 * I entered a reportage illustration competition on drawing people at work earlier this year. 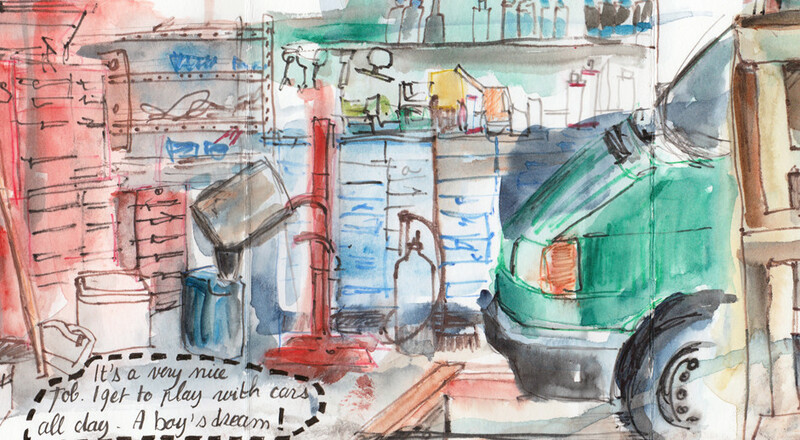 Check out my first entry A Day I The Life Of A Hairdresser and my second entry A Day At The Garage – Watercolour Pencil Drawings. Close up of the first part of my cafe sketch. I tried to draw the coziness of the small cafe. I arrived early afternoon. The small cafe was packed full of customers and I sat on the last table. It was a perfect spot to draw as I almost had a panoramic view of the shop. I ordered a slice of chocolate orange cake and a cup of tea and set up to draw. Customers and staff were moving a lot, so I started with a quick layout of the drawing and a group of customers who only had just sat down. I hoped they won’t move before I finished to draw them! They stayed long enough and the flow of customers soon quietened. So I ended up drawing a more peaceful afternoon scene, rather than a busy lunchtime one. Here I tried to capture the Spring afternoon light flooding the shop. Amy was still clearing tables and serving new customers, so it’s only when she set to clean the coffee machine before the cafe shut that I managed to draw and interview her (see the interview at the end). 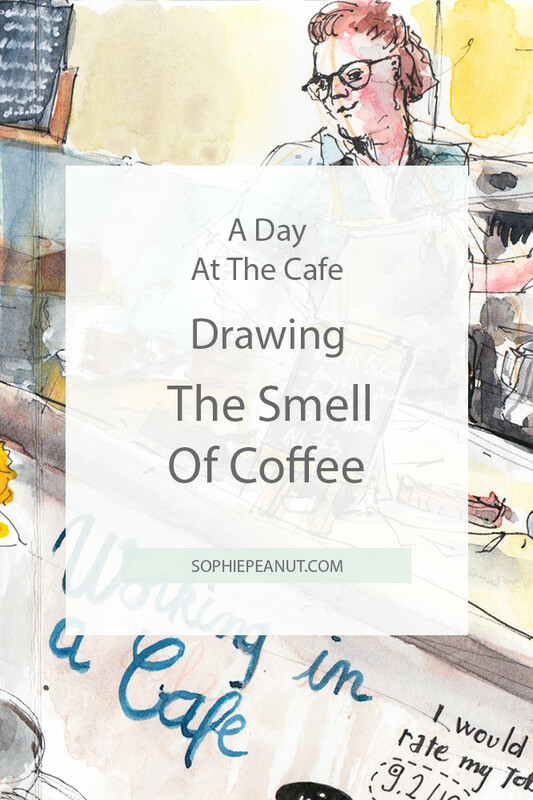 I hope that looking at my sketch you are able to almost smell the coffee and taste the cake (it was deliciously by the way!). If you do, I might be closer to understanding what good sketches are made off! 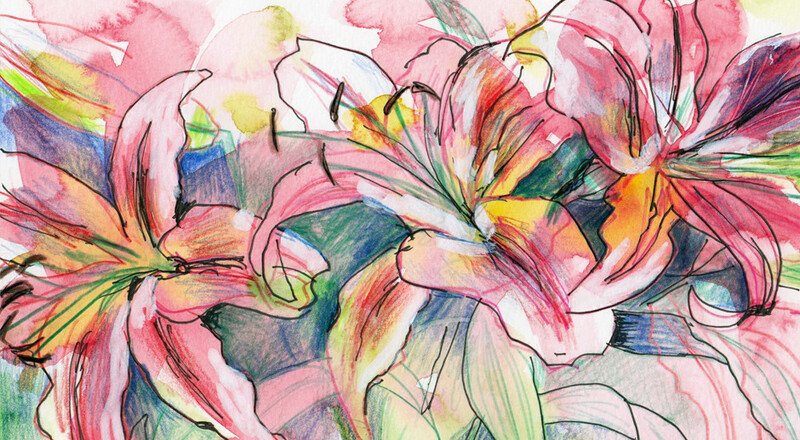 I switched from drawing in watercolour and pencil to pen and watercolour. No specific reason for that – it just felt like the right thing to do at the time. 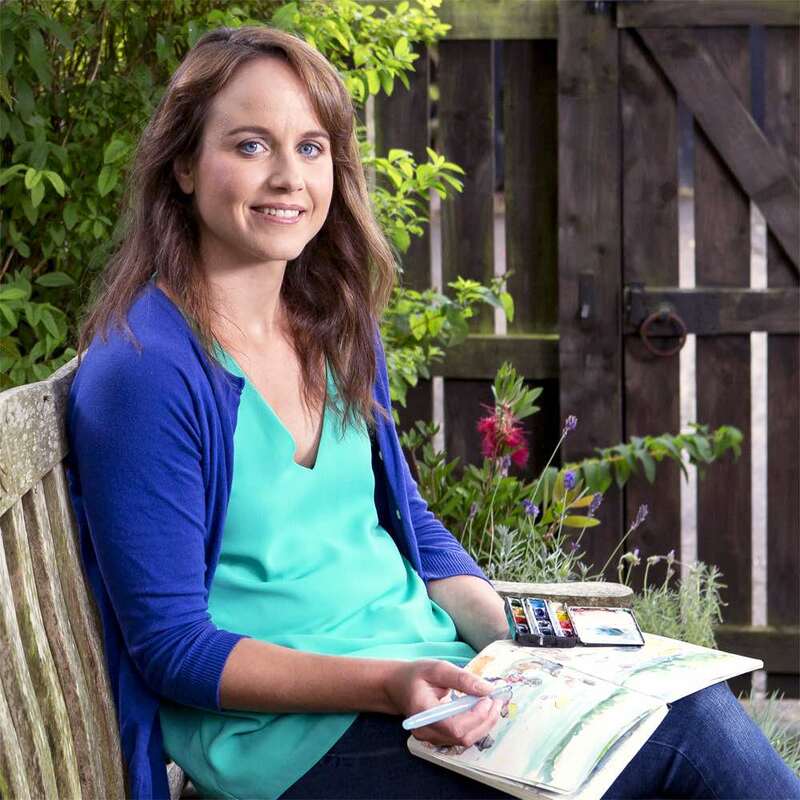 Amy works at a small vegetarian cafe tucked away on the side street of an ‘urban village’. The cafe is part of the village community. The decor is bright and the atmosphere friendly. 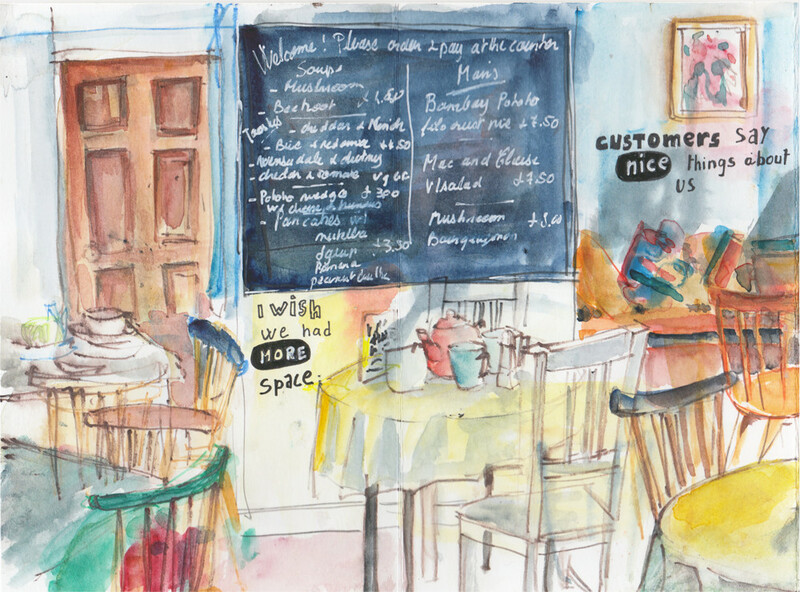 Customers walk in for a coffee and a slice of cake or a home-cooked meal. Some just want a loaf of fresh bread or a jar of artisan preserves. Most greet Amy by name. It’s only a few months since Amy joined the team. She has become more satisfied with her job as she has learned more and settled into her role. She absolutely loves making coffee – it’ her favourite part of the job. 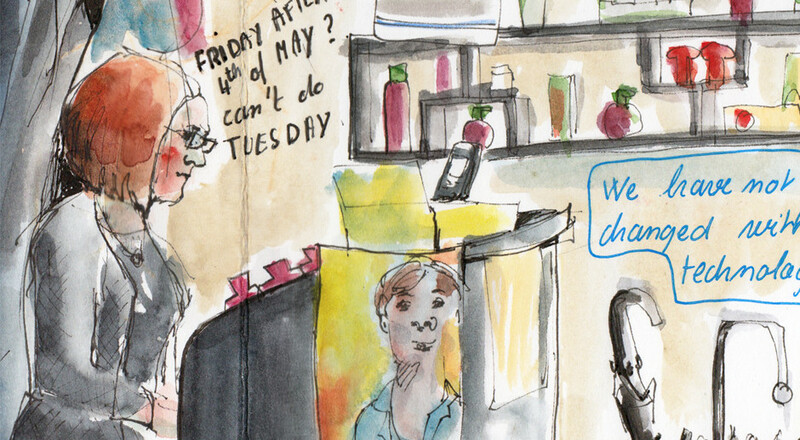 Working in a cafe is demanding – you are on your feet all day. It can be stressful when it is busy too, so it is important to work well as a team to ensure the service is smooth. While it would be nice to have more space in the cafe and cleaning at the end of a busy day is never fun, it is a fulfilling job. Amy enjoys a friendly chat with regulars at quiet times. It never gets boring. Customers’ feedback is excellent so she feels her work is valued. Amy rates her job a whopping 9.2 out of 10.